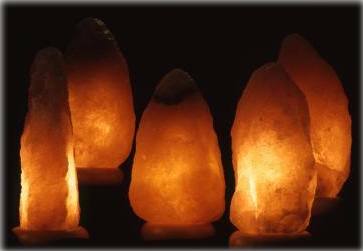 also known as salt lamp or saltlamp. Beautiful, millions of years old, salt rock crystal, known for its ability to ionise the air, thus enhancing your well being and improving your health. Nature's own air ionisers. A special type of rock crystal. Ideal gift! Many people are aware of the benefits of negative ions on our health. Negative ions are essential for our health and well being. The freshness of the air after a thunderstorm, on a mountain top, or by the seaside, are due to the high concentration of negative ions in the air. On the other hand, the reduced well being one feels in highly polluted areas, artificially air conditioned offices, or when certain hot dry wind conditions exist, are usually due to an unduly low negative ion balance (and therefore high proportion of positive ions). The original European Saltcrystal Lamps of premium quality - a distinctly different experience from Himalayan Lamps. The connoisseur's choice.